Classic Guitars in Victoria, B.C. originally started in Penticton, the home of Peter Hopkins. Michael purchased some of Peter's early instruments and knew right away that they were going to become regarded as some of the best out there. 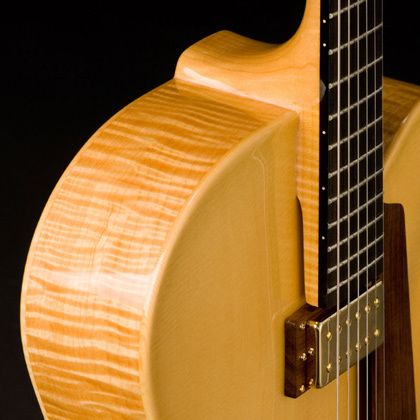 Located in Westfield, New Jersey, Golden Age Fretted Instruments carries a massive line of instruments, new and used. Contrary to it's name, Destroy All Guitars is about promoting quality guitars and their makers. Cliff Cultreri's 30 plus years of music industry experience was primarily spent producing guitar-driven music. If you just happen to be cruisin' around Shizuoka-City, Japan, you'll want to visit Velvet Sound and try out one of their Hopkins Guitars, which they give their highest rating to.